The Stanford men won the last three matches to stun Arizona 4-3 on Sunday in Tucson, Ariz.
After falling behind 3-1, the Cardinal received victories from 55th-ranked Maciek Romanowicz of Poland at No. 2 singles, Anthony Tsodikov of San Francisco at No. 5 and Robert Stineman of Winnetka, Ill., at No. 6. Stanford (8-2, 2-0 Pacific-12 Conference) swept its three-match road swing, all by 4-3 scores, and extended its winning streak to five matches. It might be the first time anyone called playing in his home country "a hostile environment." Top-ranked Bob and Mike Bryan of the United States beat unseeded Colombians Juan Sebastian Cabal and Robert Farah 7-6 (8), 6-4 on Saturday to win their first Miami title since 2008. "This is incredible for us, especially to win in such a hostile environment," Bob Bryan told on atpworldtour.com. "There were a lot of Colombians out there. They were bringing the noise. Juan and Robert should play Davis Cup here because the Colombian fans are loud. They had the flags out." The 35-year-old Bryan twins grew up in Camarillo in the Los Angeles area but live in South Florida. Unlike California, Florida has no state income tax. The Bryans each earned $1,632,854 in prize money last year. The Bryans, who starred at Stanford, won their third title in five weeks and notched their first Indian Wells-Miami double. They captured their second straight title in the BNP Paribas Open earlier this month. The Bryans have won 96 career titles, 28 at the Masters 1000 level (the highest after the Grand Slams) and three in Miami. Cabal and Farah became the first South American team to reach the Miami final. Top-ranked Rafael Nadal will face No. 2 Novak Djokovic for the singles title today (ESPN at 11:30 a.m. California time). Nadal seeks his first Miami title and Djokovic his fourth. Nadal leads the head-to-head series 22-17, but Djokovic has won the last two meetings. The fifth-ranked Stanford women remained unbeaten in their quest for a second straight NCAA title. The Cardinal trounced No. 29 Arizona 7-0 on Friday at Stanford for its fourth consecutive shutout and 17th victory in a row dating to last season. Stanford (12-0, 4-0 Pacific-12 Conference) ended a seven-match winning streak by Arizona (14-2, 3-1). The Sacramento State men suffered their first Big Sky Conference home loss in the regular season since 2005, falling to Weber State 5-2 today. The Hornets (7-12, 4-3), whose streak ended at 34 matches, played without three of their top five singles players because of injuries. Jim Courier Q&A: "30 minutes of terror"
Jim Courier is tennis' Renaissance man. --Read Armistead Maupin's novel "Maybe the Moon" during changeovers in the 1993 ATP Championships. --Gave his victory speech in French after winning Roland Garros. --Wears a suit rather than a customary warmup during Davis Cup matches as the United States' captain (Davis Cup lingo for coach). --Mentioned not only Pablo Picasso but Jackson Pollock in a recent interview. Apparently, Courier has been reading more books in the past 20 years. If there were an award for Best Vocabulary by a Sports Figure, he would win handily. When is the last time an athlete or ex-athlete used words such as "microcosm," "trepidation," "conduit," "palette" and "amorphous" in a chat with reporters? Not bad for someone who skipped college and turned professional out of Nick Bollettieri's tennis boot camp in Bradenton, Fla., where he roomed with the more promising Andre Agassi. All three -- Bollettieri, Agassi and Courier -- wound up in the International Tennis Hall of Fame (Bollettieri will be inducted in July). With his inside-out forehand, baseball-style two-handed backhand and fierce determination, Courier won two French Open and two Australian Open singles crowns, climbed to No. 1 in the world in 1992 and played on two Davis Cup championship teams. He's one of only three American men (with Don Budge and Agassi) to appear in all four Grand Slam singles finals. These days, in addition to handling his Davis Cup duties, Courier works as a tennis broadcaster and plays on the seniors circuit he founded 10 years ago. Still fit at 43 with wavy, strawberry blond hair parted down the middle, Courier could pass for a teenager. Although he can be testy because he doesn't suffer fools gladly, Courier was candid, colorful, cordial and -- sorry to spoil the alliteration -- self-deprecating during a session with a handful of reporters before facing John McEnroe in last month's Champions Shootout in Sacramento. Q: What's trickier, being the interviewer or the interviewee? A: Oh, you guys have the hard job. You have to think of the questions, and I have to react to them (tonight). I can definitely sympathize. It's about 30 minutes of terror before a match ends in Australia if I'm getting ready to interview someone (on the court). Q: How much pressure is the on-court interview? A: The pressure is on the players. We're talking about a microcosm of what they're dealing with, but within the broadcast space, that's the toughest thing because it's a high-wire act. I'm out there (in front of) 15,000 fans. That's primarily who the player is talking to, but I also have producers who want certain things. I have people criticizing me because I'm asking fluffy questions. I'm trying to the give the players an opportunity to show more of their personality early in the tournament, then when we get later in the tournament, it gets more serious, and I have to respect that we're in the quarterfinals of a Grand Slam or the semifinals and try to get something that's more pertinent to the match and scenario and history that we're witnessing. I hate it, honestly. I hate it. But I know it's something that I'm there to do and I'm expected to do. I do it with trepidation and fear because it's a YouTube moment waiting to happen. Q: Was the Aussie crowd receptive to you? Sometimes it seems they favor their own local people. A: I'm probably not the person to ask. They're not there to listen to me; they're there to listen to the players. I'm just a conduit. If I'm doing my job right, I'm representing what the audience wants to find out. If I ask a stupid question, I will hear it -- and I have heard it, because I ask at least a couple a year. A: We're in Rod Laver Arena this year, and Rod Laver is sitting right above me. I (had) read that the arena in Basel (Switzerland) is the Roger Federer Arena. So I look it up on the Internet -- which is infallible, as you know -- to confirm it, and Wikipedia says it is. Then I go on the court and present that to (Federer) and say, 'Hey, this is Rod Laver's building. You get to play in your building in Basel,' and he quickly corrects me, and the crowd whistles a little bit, and you feel like an idiot. And you are for believing the Internet. Q: Billie Jean King said the other day that tennis is an art form that shapes time and space. You've hit a million tennis balls. Do you enjoy the art of the game? backhand during the Champions Shootout. A: I'll be facing an artist across the net tonight, in all seriousness. Johnny Mac has a broad palette. My artistic sensibilities are a little more Jackson Pollock than Picasso. I'm an athlete. I do what I can with what I have. I'm not a classically trained tennis player, and as a result, I'm limited in what I'm able to do. John is the other end of that spectrum. He's truly someone who does change the geometry on the tennis court. What's beautiful about our sport is not just the one-on-one combat but the different ways each individual approaches tennis to achieve the same goal. I was asked the other night, 'Who do you like watching the most among the current players?' I don't think I'm alone in feeling like Federer is one who makes it look easier than I ever dreamed. I also love the smash-mouth tennis of (Rafael) Nadal, because I can relate to what he does a lot more, but I can appreciate Federer. Q: We've had (Stefan) Edberg, and we've had (Lew) Hoad, but is Federer the most graceful, the most beautiful of the elite champions? A: I wasn't lucky enough to see Hoad play a lot. Edberg certainly is in that class. The thing with Federer is that he doesn't even make noise when he plays. He doesn't grunt; his feet barely squeak in an era where these players are moving more than anyone ever had to on surfaces that are very audio-friendly. We get a lot of noise. He's the most beautiful player in the men's game that I've ever seen. Q: Will we ever see serve-and-volley tennis again? A: If conditions change, if the courts get quicker and (the ball stays) lower, allowing serve-and-volleyers to excel and make it more difficult for (opponents) to swing hard at balls because they're getting on them quicker and lower, then yes. It would take (indoor) tournaments like we used to see in the Bay Area and Philadelphia where it was low-bouncing and quick and virtually impossible to succeed at the baseline, as you'll see if you look at my record. A: If you have a long enough career, luck has a more limited impact. Over time, things don't necessarily balance out, but they come closer to that. Where I -- and I'm sure most competitors -- am guilty is seeing things unfairly. Someone else got more luck than we did, and maybe we don't see when we're lucky. There's no question that in my first major final, I needed luck. I was going to be three sets and out if it didn't rain because I couldn't think clearly and I needed a coaching break. I got lucky. There's no other way to describe it. Now, what I did with that moment and how I was able to take what Jose Higueras said and transform it into results speaks to what I was capable of. I'm proud of that reaction, but I don't know if I would have ever won a major if I had lost in three sets in my first major. It took Andy Murray (four) tries to get through the finish line, and he's a terrific player, as we all know. Q: Can you think of an unlucky moment in your career? A: If I could go back and put Hawkeye on the tennis court, there's one shot I'd like to know whether it was in or out. That was set point (for Courier) against Pete (Sampras) in the second-set tiebreaker at Wimbledon (in 1993). He hit a shaky forehand volley behind me, and it landed possibly on the line, possibly out, and they called it good. That was at 6-5 in that tiebreak, and I ended up losing that tiebreak [and the match 7-6 (3), 7-6 (6), 3-6, 6-3]. You just never know. Pete said after that match that he was sick to his stomach and he couldn't eat. Maybe I would have been able to tough him out and win Wimbledon, which would have been a dream come true. Q: With Stanislas Wawrinka winning the Australian Open and Murray winning two Slams, is this golden era ending, this incredible dominance of three guys? A: I think the Big Three/Big Four era -- now that Murray has become a part of that -- is at the very tail end, at the least. Wawrinka's win should signal to the others that they can break through. He beat two of those guys (Novak Djokovic and Nadal). Whatever Rafa's injury issue was, Novak didn't have that problem, and (Wawrinka) beat him in a big moment. When someone puts their hand up and says, 'I'm ready to take that on,' it's like a green light for the rest of the field. I'm not ready to give up that Big Four era because I feel like we've been lucky to witness it. It's been amazing; the matches have been incredible. (The Big Four) are still going to be there, but I don't think they're going to dominate the way they did. Q: Grigor Dimitrov, Milos Raonic, Jerzy Janowicz, Ernests Gulbis ... who is most likely to make the next move? A: It's too soon to tell. Q: Is 22, 23 the new 19? A: It's funny. I had some free time today at the hotel, and I'm getting ready to do TV in (Indian Wells), so I'm sort of getting my head around what I want to talk about. I went through the rankings, and I was looking for teenagers. The first one I found was (Australian) Nick Kyrgios (pronounced KEER-ee-ose), who's north of 150. You look for other teenagers in the top 400, and there are only eight. There were often 15 to 20 teenagers in the top 100 when I was growing up and playing, so it's changed significantly. So, yeah, 23, 24 seems to be where you're starting to get a look at what these players will be as opposed to what they are or have been. It's a different time, but short of Janowicz's (semifinal) run at Wimbledon last year, we haven't seen those guys make a deep, deep, deep run. Until they get there and show us what they're like when the spotlight hits them, it's hard to know. It's clear who has talent, and those guys you named all do. But talent is amorphous, right? You just don't know what's going to happen when pressure hits talent. Then you see what that chemical reaction is. Q: What's the best advice you've gotten during your career? I had such a force-based game -- particularly when I was raw, when I came to him -- and I would often punch myself out of matches. I wasn't willing to let other players miss. Jose opened up the other side of the court for me. I began to understand for the first time what other players do -- what they do well and what they don't do well -- and where you can wait for a mistake as opposed to taking a risk. He basically was the first one to speak to the math of the sport to me and understand how to shift the percentages to my side. That's a real small nugget, but it's an ever-important one, particularly for an offensive-minded player. Q: Was it as satisfying to win a point with an error as it was a winner? A: The Davis Cup guys have fun at my expense. Whenever there's a new player around, they pull up this YouTube of me playing Edberg in our second Aussie Open final. Edberg double-faults to give me the break of serve at 4-all in the fourth, and I just screamed, "Yesss!" There's your answer. From a sportsmanship standpoint, it's maybe not a highlight of mine, but it speaks to that (question). A: I should have been a little firmer with Sam earlier in the week to get him to play full-throttle tennis. I made a mistake there in not getting on him to play the way he plays best. Sam is not a great defensive player, and if I had been as forceful with him as I was prior to the Murray match (which Querrey lost in four sets in the clincher), I think we would have been in much better shape and we would have found ourselves in a fifth match. But I love working with these guys. I make lots of mistakes, and that's how I learn. Hopefully we'll get more chances to help these guys win this thing (for the first time since 2007), but it's been a great time for me. I really do enjoy those weeks, even though they're very stressful. A: And dinosaurs roamed the Earth. Q: There are none now (although John Isner climbed to No. 10 last week). Has the rest of the world gotten better, has the U.S. declined, or both? A: I'm developing a theory -- maybe you guys can tell me whether you think it has any merit -- because I'm asked this question so frequently. It's a valid question -- all you have to do is look at the rankings. I'm starting to look toward when tennis became an official Olympic sport. The line of demarkation was 1988 in Seoul. Looking at the amount of American men and women in the top 100, we were pretty dominant. Since then, we've seen more countries spend more resources and more athletes be pushed in that direction. Near that point in time, the wall came down in Eastern Europe, and players didn't have to defect anymore. More nations have looked toward tennis, and it's more challenging for us as a result. We can't expect to dominate. Q: What do you think of the phenomenon of past greats coaching the top players? A: (Ivan) Lendl opened things up because he showed that as a part-time coach (of Murray), you could have a full-time impact. (Jimmy) Connors was kind of a trailblazer with (Andy) Roddick. Other coaches now are following, and we'll probably see more and more of it because it's a great way to (continue competing). My outlet is the Davis Cup. Their outlet is a player who has the capability of winning a major and trying to help them do that. Q: Can you see yourself coaching on an individual level? A: Never rule anything out is probably a pretty good rule of thumb. I'm in a different stage of my life where I'm hoping to start a family, as opposed to some of these (coaches) who are on the back end of having families. The kids are now leaving, and (the fathers) have more time. Timing is really important. I don't know what the future holds for me or if anyone would ask, but it is fascinating for all of us who follow the sport to have those names involved. I'd love to see more of the women get involved. The sport is always healthier if you can keep the icons around -- the (Boris) Beckers, the Edbergs, the Lendls, the Agassis and the Samprases -- because it gives us another layer to talk about. Q: Do they have experience that other people can't offer? A: The experience gives them a lot of respect from the players who will be hiring them or seeking their counsel. There's a shared experience of dealing with big-pressure moments that you either have or don't have. It doesn't mean you can't be a better coach without it. I'm sure you can, but when top players look for counsel, they're looking for something they can relate to and something that's going to help lift them. At this level of play, it's not going to be about technique. It's going to be about the X's and the O's and about the mental side of things. That's where the top players have experience. Q: Who are the mentally toughest players you've seen? 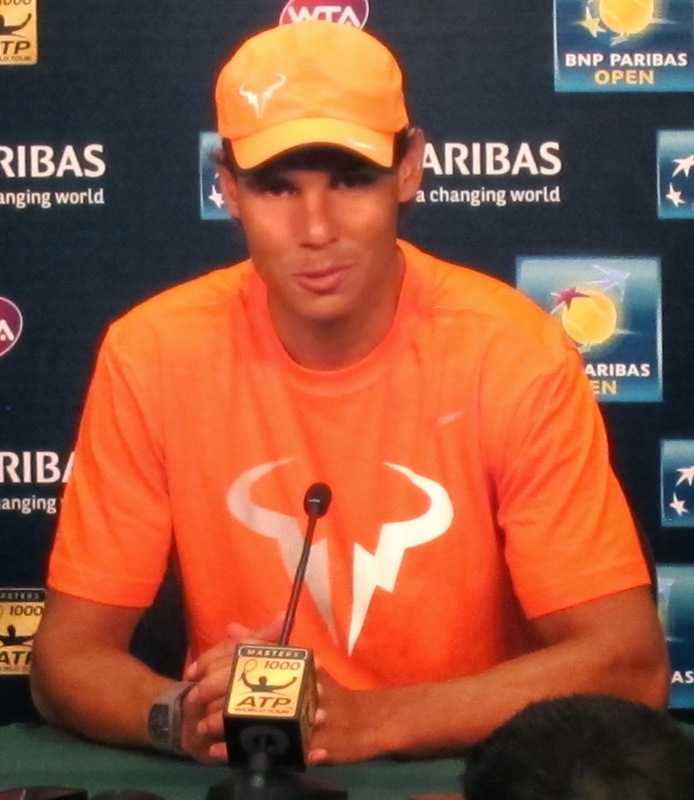 A: It's pretty clear in my mind that Rafa is No. 1. Connors would certainly be in the conversation behind him, (Michael) Chang behind him and Sampras behind him. Pete wasn't as consistent with his output, but his major final record (14-4 in Grand Slam singles finals) is incredible. Rafa and Monica Seles are my top tier on the men's and women's side. Q: What makes Nadal so mentally tough? A: He has an incredible ability to play every single point with 100 percent intensity, focus and consistency, and he doesn't deviate. Down 5-0, he doesn't look any different than if he's up 5-0. He's a marvel. A: And Robin Soderling. (Norman) is 2 for 2. Q: Has Norman been given short shrift? A: Not inside the game. He has the men's respect, both as a player and coach. He was cut down in his prime by a hip injury, and he has done a terrific, low-key job of getting the best out of his two players. He'll continue to get opportunities to work with great players because of that. Coming soon: Q&A with John McEnroe. No. 55 Maciek Romanowicz, a sophomore from Poland, beat Tamas Batyi 7-6 (5), 7-6 (5) at No. 3 singles in the deciding match as the Stanford men edged UNLV 4-3 Wednesday in Las Vegas. The Cardinal (6-2) ended a six-match winning streak by the Rebels (10-8). At least Stanford upset No. 2 seed Kansas to reach the Sweet 16 in the NCAA Division I Men's Basketball Tournament. Former Cardinal star Nicole Gibbs lost to Grace Min 7-5, 6-0 on Sunday in the final of the $25,000 Innisbrook (Fla.) Women's Open. In a matchup of unseeded young Americans, Min won her fourth singles title on the ITF Women's Circuit. She also triumphed at Innisbrook in 2012. Min, 19, captured the 2011 U.S. Open girls singles title without dropping a set and qualified for last year's French Open and U.S. Open in women's singles before losing in the first round of each. Gibbs, 21, became the fifth woman in history and fourth from Stanford to win back-to-back NCAA singles titles (2012 and 2013) and led the Cardinal to its 17th NCAA team championship last year. She then turned professional, forgoing her senior season, and won a $50,000 tournament in Yakima, Wash., last July. Entering Innisbrook, Min was ranked No. 183 in the world and Gibbs No. 192. Tursunov for the third straight time. Denis Istomin is giving Dmitry Tursunov fits. After the 29th-seeded Tursunov pulled out the first set on Saturday, Istomin reeled off nine consecutive games in a 6-7 (8), 6-0, 6-3 victory in the second round of the Sony Open in Key Biscayne, Fla.
Istomin converted 71 percent of his first serves, fired 19 aces and committed only two double faults. Tursunov, meanwhile, put in only 50 percent of his first serves and had eight aces against 14 double faults. It was the fourth meeting between the Moscow natives this year and sixth overall. Istomin, who plays for Uzbekistan, has won the last three encounters after losing the first three against Tursunov, who plays for Russia but trains in the Sacramento suburb of Granite Bay. Istomin will face top-ranked Rafael Nadal, who dismissed former world No. 1 Lleyton Hewitt 6-1, 6-3. USTA Pro Circuit -- Unseeded Nicole Gibbs, a former Stanford star from Santa Monica, defeated qualifier Louisa Chirico of Harrison, N.Y., 6-2, 6-7 (4), 6-3 to reach the final of the $25,000 Innisbrook (Fla.) Women's Open. Gibbs, the 2012 and 2013 NCAA singles champion, will meet Grace Min of Boca Raton, Fla., today for the title. Min, who won the Innisbrook title in 2012, beat qualifier Gioia Barbieri of Italy 7-6 (5), 6-2. Dmitry Tursunov and Denis Istomin are scheduled to meet for the fourth time this year today in the second round of the Sony Open in Key Biscayne, Fla.
Tursunov, seeded 29th, received a first-round bye. Istomin defeated Nicolas Mahut of France 7-6 (8), 7-6 (2). Tursunov, 31, and Istomin, 27, have faced each other five times overall. Tursunov won the first three meetings and Istomin the last two. Both players were born in Moscow. Tursunov plays for Russia but trains at the Gorin Tennis Academy in the Sacramento suburb of Granite Bay. Istomin plays for Uzbekistan. The winner of today's match likely will face top-ranked Rafael Nadal, who's set to play former world No. 1 Lleyton Hewitt, 33, today at 5 p.m. PDT (Tennis Channel). Tursunov lost to Roger Federer last week in the third round of the BNP Paribas Open in Indian Wells. BYU def. Pacific 4-3 in Stockton. No. 1 singles: Francis Sargeant (BYU) def. Sem Verbeek 7-6 (4), 7-5. Clinching match: At No. 2, Andrey Goryachkov def. Daniel Alameh 6-3, 1-6, 7-5. Records: BYU 7-9 overall, 1-0 West Coast Conference; Pacific 7-8, 1-2. Note: The Cougars trailed 3-0 in the match. No. 46 Pepperdine def. USF 6-1 in Malibu. No. 1 singles: Alex Sarkissian, ranked 27th, def. Bernardo Saraiva 6-2, 6-3. Clinching match: At No. 3, David Sofaer, ranked 115th, def. Nils Skajaa 6-2, 6-3. Records: Pepperdine 10-10, 2-0 WCC; USF 8-8, 0-3. No. 16 Cal def. No. 27 Utah 6-1 in Salt Lake City. No. 1 singles: Tereza Bekerova, ranked 125th, def. Denise Starr, ranked 26th, 6-3, 6-4. Clinching match: At No. 4, Lynn Chi, ranked 43rd, def. Sarah Richter 6-0, 3-6, 6-1. Records: Cal 9-4, 2-0 Pacific-12 Conference; Utah 10-5, 2-3. No. 36 Pepperdine def. USF 4-2 in San Francisco. No. 1 singles: Lorraine Guillermo (P) def. Andrea Ka 6-0, 6-1. Clinching match: At No. 5, Apichaya Runglerdkriangkrai def. Milica Hadzi-Tanovic 6-2, 2-6, 6-2. Records: Pepperdine 7-4 overall, 1-0 WCC; USF 11-5, 1-3. No. 71 BYU def. Pacific 6-1 in Provo, Utah. No. 1 singles: Mayci Jones (BYU) def. Iveta Masarova 6-3, 4-3, retired. Clinching match: At No. 6, Morgan Anderson-Littlewood def. Gerana Boncheva 6-1, 6-2. Records: BYU 6-6, 2-0 WCC; Pacific 6-7, 0-2.
world by reaching the semifinals at Indian Wells. The good news for the United States is that an American man returned to the top 10 in the world this week. The bad news is that -- brace yourself -- only one U.S. man is ranked in the top 60. John Isner, 6-foot-10 (2.08 meters), rose three notches to No. 10 by reaching the semifinals of the BNP Paribas Open in Indian Wells. It's the first time a U.S. man has been ranked in the top 10 since Isner reached No. 10 in September 2012. His career high is No. 9 in April 2012. Isner is one of five American men in the top 100. Then come Sam Querrey, a 6-foot-6 (1.98-meter) San Francisco native, at No. 62; former Stanford star Bradley Klahn at No. 63; Donald Young at No. 77; and Tim Smyczek at No. 98. Twenty years ago, the United States had four men in the top 10, 12 in the top 60 and 19 in the top 100. 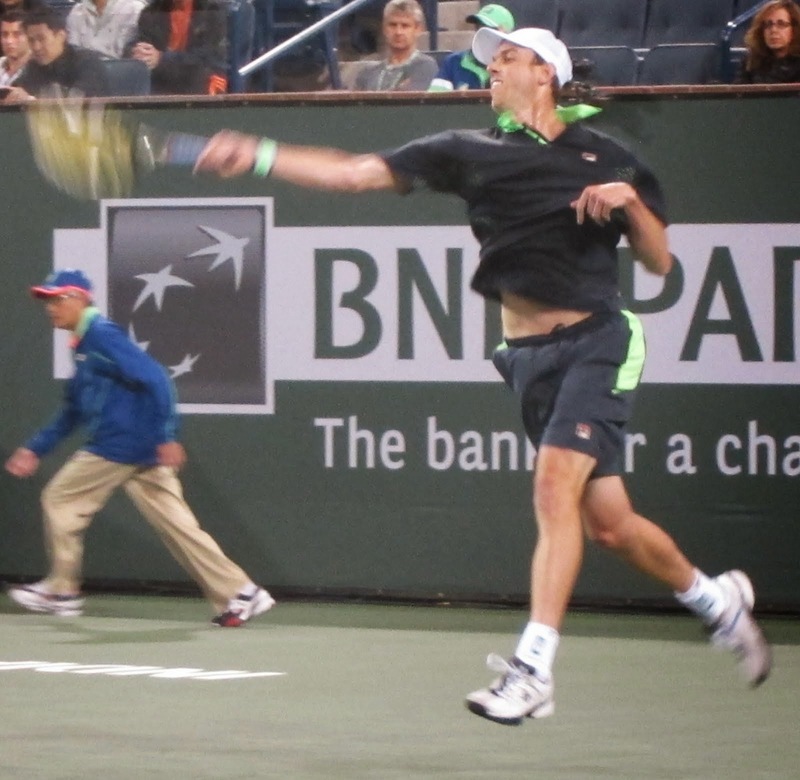 Both Isner and Querrey won Northern California titles in their professional debuts. Isner captured a Futures championship in Shingle Springs, a Sacramento suburb, in 2007 after graduating from the University of Georgia. Querrey earned a Challenger crown in Yuba City, a one-hour drive north of Sacramento, in 2006 after graduating from Thousand Oaks High School in the Los Angeles area. Sacramento State def. Maryland-Baltimore County 4-2 in Sacramento. No. 1 singles: Justin Carter (MBC) def. Roy Brandys 6-3, 6-3. Records: Sac State 6-11, Maryland-Baltimore County 9-6. Sacramento State def. Maryland-Baltimore County 4-0 in Sacramento. No. 1 singles: Daria Savchenko vs. Kim Berghaus 6-7, unfinished. Clinching match: At No. 4, Olivia Boija def. Madlena Kurasz 6-3, 6-1. Records: Sac State 5-8, Maryland-Baltimore County 6-7. Note: Sac State's No. 1 singles player, Jennifer Nguyen, missed the match with an injury. Hawaii def. USF 6-1 in Honolulu. No. 1 singles: Bernardo Saraiva (USF) def. Jonathan Brooklyn 6-4, 5-7, 7-6 (6). Clinching match: At No. 3, Chas Okamoto def. Thomas Takemoto 7-6 (4), 7-5. Records: Hawaii 2-8, USF 8-8. Note: The Rainbow Warriors ended an eight-match losing streak. USF def. Loyola Marymount 7-0 in San Francisco. No. 1 singles: Andrea Ka def. Jessica Perez 6-1, 6-4. Records: USF 11-4 overall, 1-2 West Coast Conference; Loyola Marymount 6-9, 0-2. San Jose State def. Texas-Arlington 4-0 in San Jose. No. 1 singles: Marie Klocker def. Elizabeth Thoms 6-2, 6-2. Clinching match: At No. 2, Gaelle Rey def. Giada D'ortona 6-3, 6-4. Records: San Jose State 9-10, Texas-Arlington 8-7. Sam Querrey soared in this week's rankings. Unfortunately for the 26-year-old San Francisco native, it was in doubles rather than singles. But he'll take it. Querrey reached the semifinals of the BNP Paribas Open in Indian Wells with his Davis Cup teammate, John Isner, to jump 83 places to No. 114 in the world. The unseeded Querrey, 6-foot-6 (1.98 meters), and Isner, 6-10 (2.08 meters), knocked off eighth-seeded Lukasz Kubot of Poland and Robert Lindstedt of Sweden in the second round and third-seeded Ivan Dodig of Croatia and Marcelo Melo of Brazil in the quarterfinals before losing to top seeds and eventual champions Bob and Mike Bryan. Kubot and Lindstedt won the Australian Open in January for their first Grand Slam title, and Dodig and Melo advanced to last year's Wimbledon final before losing to the Bryans. Isner and Querrey were the runners-up to Spain's Marc Lopez and Rafael Nadal at Indian Wells in 2012. Querrey slipped another five spots in singles to No. 62 after losing to 29th-seeded Andreas Seppi of Italy in the second round at Indian Wells. The American has career highs of No. 17 in singles (2011) and No. 23 in doubles (2010). Querrey grew up in Santa Rosa (near San Francisco), Las Vegas and Thousand Oaks in the Los Angeles area. He lives in Las Vegas; Nevada, unlike California, has no state income tax. Bradley Klahn, 23 years old, 2010 NCAA singles champion and 2011 NCAA doubles runner-up from Stanford -- Career-high No. 63 in singles (+1), No. 133 in doubles (-2). Scott Lipsky, 32 years old, 2002 NCAA doubles runner-up from Stanford -- No. 37 in doubles (-3), unranked in singles. Sam Querrey, 26 years old, San Francisco native, Capitals (2012-13) -- No. 62 in singles (-5), No. 114 in doubles (+83). Dmitry Tursunov, 31 years old, trains at Gorin Tennis Academy in Sacramento suburb of Granite Bay -- No. 30 in singles (no change), No. 108 in doubles (+1). Mallory Burdette, 23 years old, NCAA singles runner-up in 2012 and NCAA doubles champion in 2011 and 2012 from Stanford -- No. 219 in singles (-56), No. 1,137 in doubles (+2). Nicole Gibbs, 21 years old, NCAA singles champion in 2012 and 2013 and NCAA doubles champion in 2012 from Stanford -- No. 192 in singles (-1), No. 405 in doubles (-3). Macall Harkins, 28 years old, Redding resident -- No. 358 in doubles (-26), No. 687 in singles (-3). Raquel Kops-Jones, 31 years old, 2003 NCAA doubles champion from Cal -- No. 18 in doubles (+1), No. 1,094 in singles (-8). Maria Sanchez, 24 years old, born and raised in Modesto -- No. 100 in doubles (no change), No. 245 in singles (-32). No. 16 Cal def. No. 19 Tulsa 7-0 in Berkeley. No. 1 singles: No. 28 Denise Starr def. Isaura Enrique 6-4, 6-4. Clinching match: At No. 6, Maegan Manasse, ranked 108th, def. Saana Saartienen 6-0, 7-5. Records: Cal 8-4, Tulsa 12-4. Texas-Arlington def. Sacramento State 4-2 in Sacramento. No. 1 singles: Elizabeth Thoms (TA) def. Jennifer Nguyen 1-4, retired. Clinching match: At No. 3, Angeles de los Rios def. Alina Soltanici 6-4, 6-2. Records: Texas-Arlington 8-6, Sac State 4-8. Idaho def. Sacramento State 4-1 in Sacramento. No. 1 singles: Artemiy Nikitin (I) def. Roy Brandys 6-1, 7-5. Records: Idaho 6-9, Sac State 5-11. First round (men and women), Tennis Channel, 8 a.m.-6:30 p.m. (live), 7:30 p.m.-7 a.m. Thursday (repeat). Early rounds (men and women), Tennis Channel, 8 a.m.-8 p.m. (live), 8 p.m.-8 a.m. Friday (repeat). Early rounds (men and women), Tennis Channel, 8 a.m.-8:30 p.m. (live), 8:30 p.m.-8 a.m. Saturday (repeat). Early rounds (men and women), Tennis Channel, 8 a.m.-8:30 p.m. (live), 8:30 p.m.-8 a.m. Sunday (repeat). Early rounds (men and women), Tennis Channel, 8 a.m.-8:30 p.m. (live), 8:30 p.m.-8 a.m. Monday (repeat). Women's round of 16, men's third round, Tennis Channel, 8 a.m.-8:30 p.m. (live), 8:30 p.m.-8 a.m. Tuesday (repeat). Women's quarterfinal, men's round of 16, Tennis Channel, 8 a.m.-8:30 p.m. (live), 8:30 p.m.-10 a.m. Wednesday (repeat). Men's and women's quarterfinals, ESPN2, 10 a.m.-2 p.m. (live). Men's and women's quarterfinals, Tennis Channel, 4-8 p.m. (live). Women's semifinals, men's quarterfinals, ESPN2, 10 a.m.-2 p.m. and 4-8 p.m. (live). Men's semifinals, ESPN2, noon-2 p.m. and 4-6 p.m. (live), 7-11 p.m. (repeat). Women's final, ESPN2, 10 a.m.-noon (live). Women's final, Tennis Channel, 5-7 p.m. and 9-11 p.m. (repeat). Men's final, ESPN2, 11:30 a.m.-2 p.m. (live). No. 18 Oklahoma State def. USF 7-0 in Manoa, Hawaii. No. 1 singles: Jakob Sude, ranked 72nd, def. Bernardo Saraiva 6-4, 6-4. Records: Oklahoma State 16-2, USF 8-7. Note: The Cowboys recorded their fifth consecutive shutout, having previously thrashed New Orleans, Oral Roberts, Nebraska-Omaha and Lamar in Stillwater, Okla.
Pacific def. Idaho 5-2 in Stockton. No. 1 singles: Sem Verbeek (P) def. Artemiy Nikitin 6-1, 6-3. Records: Pacific 7-7, Idaho 5-9. April 19-20 -- Fed Cup semifinals, World Group playoffs (United States vs. France in St. Louis), www.fedcup.com. Jessica Willett pulled off an incredible feat on Sunday. The junior from Fallbrook, near San Diego, saved 11 match points in a 6-2, 0-6, 7-5 victory over Suzy Tan at No. 5 singles to clinch San Jose State's 4-2 victory over Dartmouth in San Jose. "It's always great to clinch the match," Willett, who had lost the clincher against No. 19 Tulsa earlier in the day, said on sjsuspartans.com. "The pressure was high, so it was cool to overcome that. "I had to take the positives from that and learn from things that weren't working and focus on things moving forward and take things moment by moment." No. 19 Tulsa def. San Jose State 4-0 in San Jose. No. 1 singles: Samantha Vickers (T) def. Marie Klocker 6-0, 6-1. Clinching match: At No. 5, Rongrong Leenabanchong def. Jessica Willett 6-2, 6-3. Records: Tulsa 12-3, San Jose State 7-10. San Jose State def. Dartmouth 4-2 in San Jose. No. 1 singles: Marie Klocker (SJS) vs. Katherine Yau 6-4, 6-7 (1), unfinished. Clinching match: At No. 5, Jessica Willett def. Suzy Tan 6-2, 0-6, 7-5. Records: San Jose State 9-10, Dartmouth 3-3. No. 34 Saint Mary's def. San Diego 4-0 in San Diego. No. 1 singles: Eleventh-ranked Jenny Jullien def. Shani Blecher 6-3, 6-3. Clinching match: At No. 2, Danielle Flores def. Marta Stojanovic 6-3, 6-1. Records: Saint Mary's 6-5 overall, 1-0 West Coast Conference; San Diego 5-8, 1-2. Sacramento State def. Idaho State 6-1 in Sacramento. No. 1 singles: Jennifer Nguyen (SS) def. Marian Tangarife 6-0, 6-1. Clinching match: At No. 5, Olivia Boija def. Wiebke Boeckmann 6-1, 6-0. Records: Sac State 4-7 overall, 3-0 Big Sky Conference; Idaho State 1-8, 0-3. Note: The Hornets extended their conference winning streak to 108 matches. No. 20 Cal def. No. 31 Tulsa 4-0 in Indian Wells. No. 1 singles: Ben McLachlan (C), ranked 84th, vs. No. 63 Japie De Klerk, abandoned. Clinching match: At No. 2, Campbell Johnson, ranked 81st, def. Clifford Marsland, ranked 68th, 6-3, 3-6, 6-3. Records: Cal 9-3, Tulsa 10-7. Arizona def. Saint Mary's 6-1 in Tucson, Ariz. No. 1 singles: Kieren Thompson (A) def. Joakim Norstrom 6-4, 6-4. Clinching match: At No. 2, Naoki Takeda def. Tuomas Manner 6-2, 6-3. Records: Arizona 10-8, Saint Mary's 5-6. No. 49 Santa Clara def. New Mexico State 4-3 in Santa Clara. No. 1 singles: John Lamble (SC) def. Strahinja Trecakov 7-6, 6-3. Records: Santa Clara 10-2, New Mexico State 8-8. Sacramento State def. Idaho State 7-0 in Sacramento. No. 1 singles: Marek Marksoo def. Jamey Swiggart 6-0, 4-6 [10-5]. Clinching match: At No. 3, Niranjan Ram def. Josh Goodwin 6-2, 6-0. Records: Sacramento State 5-10 overall, 3-2 Big Sky Conference; Idaho State 1-7, 1-4. It took Bob and Mike Bryan 15 attempts to win the doubles title at Indian Wells in their native Southern California. Now the identical twins, who will turn 36 next month, have won two in a row. The top-ranked Bryans outclassed second-seeded Alexander Peya of Austria and Bruno Soares of Brazil 6-4, 6-3 on Saturday in the BNP Paribas Open. Peya and Soares had eliminated Switzerland's Roger Federer and Stanislas Wawrinka, the 2008 Olympic gold medalists, in the semifinals. The Bryans won their second title of the year, 27th in a Masters 1000 tournament and record 95th overall. They were born and raised in Camarillo in the Los Angeles area and led Stanford to NCAA team titles in their two years there (1997 and 1998) before turning professional. Futures -- Collin Altamirano, an 18-year-old qualifier from Elk Grove in the Sacramento area, lost to third-seeded Daniel Kosakowski of Downey in the Los Angeles region 3-6, 7-6 (2), 6-3 in the semifinals of the $15,000 Three-Way Chevrolet Cadillac Bakersfield (Calif.) Tennis Open. Kosakowski, a former UCLA star who qualified for the BNP Paribas Open before losing in the first round, will meet eighth-seeded Mitchell Krueger of Aledo, Texas, in today's final. Krueger dispatched seventh-seeded Marek Michalicka of the Czech Republic 6-4, 6-3. No. 12 Baylor def. No. 20 Cal 4-1 in Indian Wells. No. 1 singles: Eighth-ranked Julian Lenz (B) def. No. 84 Ben McLachlan 3-6, 6-2, 6-2. Clinching match: At No. 5, Mate Zsiga def. Gregory Bayane 4-6, 6-4, 6-4. Records: Baylor 10-4, Cal 8-3. New Mexico State def. Sacramento State 5-2 in Sacramento. No. 1 singles: Marek Marksoo (SS) def. Strahinja Trecakov 7-5, 6-3. Records: New Mexico State 8-7, Sac State 4-10. Utah State def. Saint Mary's 4-2 in Tucson, Ariz. No. 1 singles: Dennis Baumgartner (US) def. Joakim Norstrom 7-5, 6-3. Clinching match: At No. 4, Matt Sweet def. Thomas Hunt 3-6, 6-4, 7-5. Records: Utah State 7-7, Saint Mary's 5-5. No. 16 Cal def. No. 42 Washington 7-0 in Berkeley. No. 1 singles: Denise Starr, ranked 26th, def. Elianne Douglas-Miron, ranked 97th, 6-2, 6-1. Clinching match: At No. 4, 43rd-ranked Lynn Chi def. Andjela Nemcevic 6-0, 6-1. Records: Cal 7-4 overall, 1-0 Pacific-12 Conference; Washington 10-4, 0-1. No. 59 Santa Clara def. Loyola Marymount 4-3 in Santa Clara. No. 1 singles: Katie Le, ranked 28th, def. Jessica Perez 6-3, 6-4. Clinching match: At No. 4, Stephanie Skaras def. Laura Mueller 6-4, 4-6, 6-2 with Santa Clara leading 3-2. Records:Santa Clara 7-4, 2-0 West Coast Conference; Loyola Marymount 6-8, 0-1. Sacramento State def. Southern Utah 7-0 in Sacramento. No. 1 singles: Jennifer Nguyen def. Alex Ivanova 6-1, 6-0. Clinching match: At No. 3, Alina Soltanici def. Jane Marushko 6-3, 6-0. Records: Sac State 2-7 overall, 1-0 Big Sky Conference; 3-5, 0-2. Sacramento State def. Weber State 7-0 in Sacramento. No. 1 singles: Jennifer Nguyen def. Agata Bachanek 6-2, 6-3. Clinching match: At No. 6, Olivia Boija def. Michelle Warwick 6-1, 6-3. Records: Sac State 3-7 overall, 2-0 Big Sky Conference; Weber State 5-7, 0-3. Collin Altamirano reached his first singles semifinal in a professional tournament. 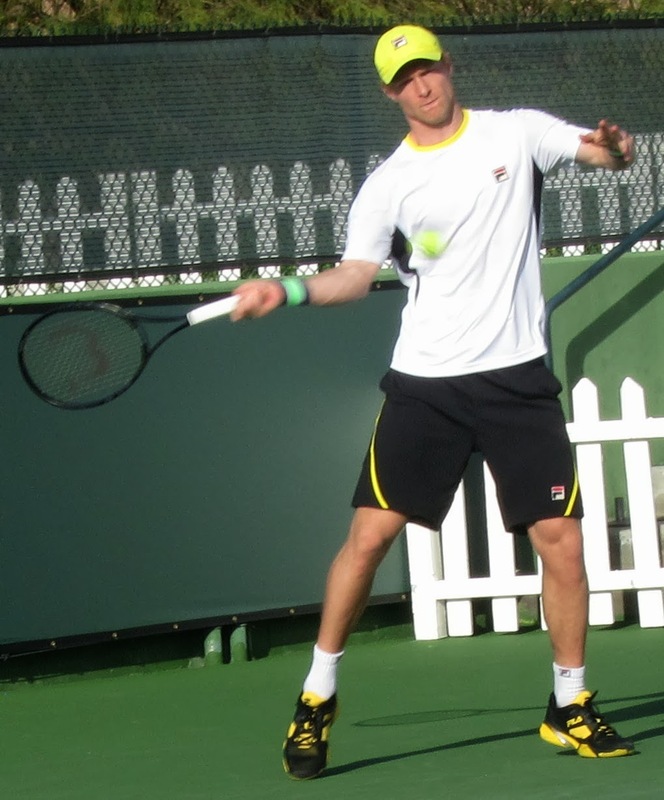 The 18-year-old qualifier from Elk Grove in the Sacramento area routed his doubles partner, 17-year-old wild card Deiton Baughman of Carson, 6-3, 6-1 Friday in the $15,000 Three-Way Cadillac Bakersfield (Calif.) Tennis Open. Altamirano, who won the USTA Boys 18 National Championships last August, remains an amateur. He and Baughman won the doubles title in a $10,000 pro tournament in Boynton Beach, Fla., last month. Altamirano has a tough assignment in the Bakersfield semis against third-seeded Daniel Kosakowski, a 22-year-old former UCLA star. Kosakowski won two qualifying matches -- including one over Belgium's David Goffin, ranked 95th in the world -- last week to reach the main draw of the prestigious BNP Paribas Open in Indian Wells. Kosakowski then lost to Dominic Thiem, a 20-year-old Austrian qualifier ranked No. 101, in the first round. The BNP Paribas Open is one of nine Masters 1000 tournaments, the highest level of men's professional tennis below the Grand Slams, on the ATP World Tour. In the other Bakersfield semifinal, seventh-seeded Marek Michalicka of the Czech Republic will meet eighth-seeded Mitchell Krueger of Aledo, Texas. No. 4 Stanford def. No. 42 Washington 7-0 at Stanford. No. 1 singles: Kristie Ahn, ranked second, def. Elianne Douglas-Miron, ranked 97th, 6-0, 6-0. Clinching match: At No. 6, Caroline Doyle def. Angela Chen 6-0, 6-2. Records: Stanford 9-0 overall, 1-0 Pacific-12 Conference; Washington 10-5, 0-3. Note: Doyle is a freshman from San Francisco. Former Sacramento Capitals owner Deepal Wannakuwatte, charged with conspiracy and fraud, recently was denied bail as a flight risk. Wannakuwatte, a 63-year-old native of Sri Lanka, was arrested on Feb. 20 in Sacramento after allegedly defrauding investors of millions in his medical supply businesses. "He's a skilled manipulator and talented con man," Assistant U.S. Attorney Michael Beckwith told U.S. Magistrate Judge Allison Claire at a bail hearing, The Sacramento Bee reported. "He has the money, the connections and the motive to flee." According to the FBI, investment brochures for Wannakuwatte's International Manufacturing Group Inc. and RelyAid said sales reached $110 million in 2012, mostly from the U.S. Department of Veterans Affairs. In reality, the FBI said, sales to the VA totaled just $25,000 a year. Agents said Wannakuwatte usually repaid investors with funds from new investors. If found guilty, Wannakuwatte could spend the rest of his life in prison, Beckwith said. The Capitals of World TeamTennis announced on Feb. 4 that they were moving to Las Vegas after 28 years because Sacramento lacks a permanent tennis facility. However, WTT terminated the franchise last week. The league will begin its 39th season on July 6 with seven teams. Sacramento State --Seven matches (four men's and three women's) have been moved on campus during a three-week stretch in March and early April, Sac State announced. Men -- Tuesday vs. Idaho, 2 p.m.; Thursday vs. Maryland-Baltimore County, 2 p.m.; March 25 vs. Eastern Washington, 1 p.m.; March 27 vs. Weber State, 10 a.m.
Women -- Thursday vs. Maryland-Baltimore County, 2:30 p.m.; April 5 vs. UC Irvine, 1 p.m.; April 6 vs. Saint Mary's, 1 p.m.
No. 68 San Diego def. Pacific 4-3 in Stockton. No. 1 singles: Clarke Spinosa, ranked 59th, def. Sem Verbeek 6-4, 6-4. Clinching match: At No. 5, Geoffrey Fasso def. Ben Mirkin 6-3, 3-6, 6-4. Records: San Diego 7-4, 3-0 West Coast Conference; Pacific 6-7, 1-1. Hawaii def. Pacific 6-1 in Honolulu. No. 1 singles: Cindy Nguyen (H) def. Iveta Masarova 6-2, 6-2. Records: Hawaii 6-7, Pacific 6-6. The Sacramento Capitals lasted 28 years in World TeamTennis. Their successor, the Las Vegas Neon, lasted just over 28 days. WTT termined its agreement with Capital Sports Management LLC regarding the Neon "due to the franchise's failure to meet its obligations to Mylan World TeamTennis," the league announced on March 5. Translation: Team owner Deepal Wannakuwatte is in a Sacramento jail on charges of orchestrating a $150 million fraud while recruiting investors for his medical supply business. "We are disappointed that we won't be able to bring the excitement and energy of Mylan WTT to Las Vegas this coming season," league CEO/commissioner Ilana Kloss said in a statement. "We are grateful to the Las Vegas tennis community, Darling Tennis Center and city leadership for their support and understanding around this unexpected development involving the Neon team franchise ownership. "We still believe that Las Vegas would be a terrific home for a Mylan WTT team and hope to revisit Las Vegas as a potential market in the future." The Capitals, owned by Wannakuwatte, announced on Feb. 4 that they were moving to Las Vegas because the Sacramento area lacks a permanent tennis facility. WTT will open its 39th season on July 6 with seven teams: the Austin Aces, San Diego Aviators, Springfield (Mo.) Lasers and Texas Wild in the Western Conference and the Washington Kastles, Boston Lobsters and Philadelphia Freedoms in the Eastern Conference. Washington has won the last three WTT titles. The Austin franchise moved from Orange County and the San Diego team relocated from New York after last season. Texas moved from Kansas City after the 2012 campaign. Only one player from last year's Capitals, doubles specialist Megan Moulton-Levy, is listed on a roster this year. The 5-foot (1.52-meter) American, who turned 29 on Tuesday, will play for Boston. Not scheduled to play WTT are 2013 Capitals Mark Knowles, Mardy Fish, Ryan Sweeting, Sam Querrey and Taylor Townsend. Knowles, a 12-year WTT veteran (all with the Capitals), won the league's Male MVP award in 2001, 2005 and 2007. Fish, 32, has been plagued by an irregular heartbeat. Sweeting, 26, underwent back surgery last August and married Kaley Cuoco, a star on the hit television comedy "The Big Bang Theory," on Dec. 31. No. 68 San Diego def. Saint Mary's 7-0 in Moraga. No. 1 singles: Clarke Spinosa, ranked 59th, def. Joakim Norstrom 6-2, 6-2. Clinching match: At No. 2, Uros Petronijevic def. Tuomas Manner 6-2, 6-2. Records: San Diego 6-4 overall, 1-0 West Coast Conference; Saint Mary's 5-4, 0-1. UC Davis def. Youngstown State 7-0 in Davis. No. 1 singles: Alex Adamson def. Sebastian Hagn 6-0, 7-5. Records: UC Davis 8-6, Youngstown State 3-9. UC Davis def. Youngstown State 4-3 in Davis. No. 1 singles: Megan Heneghan (UCD) def. Margarita Sadovnikova 6-1, 6-4. Clinching match: At No. 3, Melissa Kobayakawa def. Annina Brendel 6-0, 6-4. Records: UC Davis 7-6, Youngstown State 5-8. Pacific def. Grand Canyon 4-3 in Honolulu. No. 1 singles: Iveta Masavova (P) def. Priscilla Annoual 0-6, 7-5, 6-2 in clinching match. Records: Pacific 6-5, Grand Canyon 6-4. Preview, Tennis Channel, 10:30-11 a.m. (live). Men's round of 16 and women's quarterfinals, Tennis Channel, 11 a.m.-11 p.m. (live). Men's and women's quarterfinals, Tennis Channel, 11 a.m.-5 p.m. (live). Men's quarterfinals, Tennis Channel, 7-9 p.m. (live). Men's quarterfinals, ESPN2, 1:30-3:30 p.m. (live). Men's quarterfinals, Tennis Channel, 3:30-5:30 p.m. (live). First women's semifinal, Tennis Channel, 6:30-8:30 p.m. (live). First women's semifinal, second semifinal (women), ESPN2, 8:30-10:30 p.m. (live). First men's semifinal, ESPNNews, noon-2 p.m. (live), 7-9 p.m. (repeat). Second men's semifinal, ESPNNews, 2-4 p.m. (live), 9-11 p.m. (repeat). Men's doubles final, Tennis Channel, 5:30-7 p.m. (live), 11 p.m.-12:30 a.m. Sunday (repeat). Women's final, ESPN2, noon-2 p.m. (live). Men's final, ESPN2, 2-4 p.m. (live). Women's final, Tennis Channel, 5:30-7:30 p.m. and 9:30-11:30 p.m. (repeat). Men's final, Tennis Channel, 7:30-9:30 p.m. (repeat). No. 20 Cal def. Texas Christian 4-3 in Berkeley. No. 1 singles: Ben McLachlan, ranked 84th, def. Nick Chappell, ranked 54th, 7-6 (9), 3-6, 7-6 (3) in clinching match. Records: Cal 8-2, Texas Christian 7-5. Pacific def. USF 4-1 in San Francisco. No. 1 singles: Bernardo Saraiva (USF) def. Daniel Alameh 7-5, 6-1. Records: Pacific 6-6 overall, 1-0 West Coast Conference; USF 8-6, 0-2. San Jose State def. Southern Utah 4-0 in San Jose. No. 1 singles: Margarita Sadovnikova (SU) def. Marie Klocker 6-7, 7-6 [11-9]. Records: San Jose State 6-8, Southern Utah 3-3. San Jose State def. Youngstown State 4-3 in San Jose. No. 1 singles: Marie Klocker (SJS) def. Aleksandra Ivanova 6-2, 6-0. Records: San Jose State 7-8, Youngstown State 5-8. Through March 16 -- BNP Paribas Open, Indian Wells, Calif., www.bnpparibasopen.com. 2013 champions: Rafael Nadal, Maria Sharapova, Bob Bryan-Mike Bryan, Ekaterina Makarova-Elena Vesnina. President Barack Obama hosted the Stanford women and 18 other NCAA championship teams from 2012-13 at a White House celebration on Monday. The ceremony took place on the South Lawn, and the teams toured the White House. "Wow," Stanford's Kristie Ahn tweeted. "It was an honor to meet the president & tour the White House. Crazy to be where all the greats have lived." Ahn, from Upper Saddle River, N.J., clinched Stanford's dramatic 4-3 victory over Texas A&M in the NCAA final last May. Now a senior, she plays No. 1 singles and doubles for the ninth-ranked Cardinal (8-0). Stanford has made six visits to the White House. Until Monday, the most recent was by the men's volleyball team in 2010. BNP Paribas Open in Indian Wells -- Four-time champion Roger Federer, seeded seventh, beat 27th seed Dmitry Tursunov, who's based in the Sacramento suburb of Granite Bay, 7-6 (7), 7-6 (2) in the third round. Tursunov double-faulted six times, including at 7-7 in the first tiebreaker and 1-1 in the second, and converted only 46 percent of his first serves. The 31-year-old Russian fell to 0-4 lifetime against Federer. However, Tursunov equaled his best result in eight appearances in Indian Wells by reaching the third round. All men's and women's seeds received first-round byes. USF def. Sonoma State 5-2 in San Francisco. No. 1 singles: Bernardo Saraiva (USF) def. Matt Roberts 6-0, 6-4. Records: USF 7-5 (Monday's result against Youngstown State not available), Sonoma State 1-6. USF def. Youngstown State 7-0 in San Francisco. No. 1 singles: Andrea Ka def. Margarita Sadovnikova 3-6, 6-1, 6-2. Records: USF 9-4, Youngstown State 5-7. USF def. Southern Utah 4-0 in San Francisco. No. 1 singles: Thyra Taune def. Aleksandra Ivanova 6-0, 6-1. Records: USF 10-4, Southern Utah 3-2. The No. 9 Stanford women remained undefeated with a 5-2 victory over No. 16 Cal in Berkeley on Saturday. The defending NCAA champion Cardinal improved to 8-0 while the Bears fell to 6-4. At No. 1 singles, fifth-ranked Kristie Ahn of Stanford outclassed No. 26 Anett Schutting 6-3, 6-3. Carol Zhao, ranked 31st, clinched the match for the Cardinal with a 6-3, 6-7 (6), 6-4 triumph over No. 28 Denise Starr at No. 3 singles. No. 30 Texas Tech def. No. 71 Santa Clara 4-1 in Santa Clara. No. 1 singles: No. 25 Katie Le (SC) def. Kenna Kilgo 6-0, 6-2. Records: Texas Tech 10-5, Santa Clara 6-4. No. 54 Saint Mary's def. Tulane 5-0 in Moraga. No. 1 singles: Eighth-ranked Jenny Jullien vs. Klara Vyskocilova 3-6, 6-1, 1-1, unfinished. Clinching match: At No. 4, Catherine Leduc, ranked 64th, def. Meredith Maltby 6-3, 6-2. Records: Saint Mary's 5-5, Tulane 4-10. UC Davis def. Cal Poly 4-2 in San Luis Obispo. No. 1 singles: Megan Heneghan (UCD) def. Jennifer Cornea 6-4, 6-1. Clinching match: At No. 5, Tiffany Pham def. Ane McPike 3-6, 6-3, 6-3. Records: UC Davis 5-7 overall, 2-2 Big West Conference; Cal Poly 3-6, 0-3. Pacific def. Youngstown State 5-2 in Stockton. No. 1 singles: Iveta Masarova (P) def. Margarita Sadovnikova 6-4, 6-2. Records: Pacific 5-5, Youngstown State 5-6. Stanford def. Furman 7-0 at Stanford. No. 1 singles: John Morrissey def. Adam Steryous 4-6, 6-1 [10-8]. Clinching match: At No. 6, Yale Goldberg def. Joel Cook 6-2, 7-5. Records: Stanford 4-2, Furman 6-5. Sacramento State def. Portland State 7-0 in Sacramento. No. 1 singles: Roy Brandys def. Brent Wheeler 5-7, 6-4 [15-13]. Clinching match: At No. 4, Joaquin Marquez def. Alex Marx 6-3, 7-5. Records: Sac State 3-9 overall, 1-2 Big Sky Conference; Portland State 1-10, 0-4. Note: The Hornets snapped a six-match losing streak. Sac State def. Southern Utah 7-0 in Sacramento. No. 1 singles: Brandys def. Troy Benson 6-0, 6-2. Clinching match: At No. 3, Tom Miller def. Alex Dial 6-0, 6-1. Records: Sac State 4-9 overall, 2-2 Big Sky; Southern Utah 0-1, 0-1. UC Davis def. Montana 6-1 in Davis. No.1 singles: Alec Adamson (UCD) def. Andrew Warren 6-7, 6-1 [11-9]. Records: UC Davis 6-6, Montana 3-6. UC Davis def. Sonoma State 7-0 in Davis. No. 1 singles: Adamson def. Matt Roberts 6-1, 6-3. Records: UC Davis 7-6, Sonoma State 1-5. Pacific def. Youngstown State 7-0 in Stockton. No. 1 singles: Daniel Alameh def. Silviu Mistreanu 6-2, 6-2. Records: Pacific 5-6, Youngstown State 3-7. Dmitry Tursunov got his wish. One week after almost playing Roger Federer in Dubai, Tursunov is scheduled to face the Swiss star on Monday in the third round of the BNP Paribas Open in Indian Wells. The 27th-seeded Tursunov, a Russian who trains in the Sacramento suburb of Granite Bay, advanced Saturday with a 7-6 (4), 6-4 victory over Juan Monaco of Argentina. The right-handed Monaco reached a career-high No. 10 in the world in 2012 but was troubled by a right wrist injury last year. Federer, seeded seventh, eliminated Paul-Henri Mathieu of France 6-2, 7-6 (5). All men's and women's seeds received first-round byes in the BNP Paribas Open. Federer, 32, is 3-0 lifetime against Tursunov, 31. They would have met last week in the quarterfinals at Dubai if Tursunov had beaten Lukas Rosol of the Czech Republic in the second round, but Tursunov was hobbled by a leg injury and lost. Federer went on to win Dubai, where he has a residence, to surpass John McEnroe with his 78th career singles title. Federer, who seeks his fifth crown at Indian Wells, ranks third in the Open era (since 1968) behind Jimmy Connors' 109 titles and Ivan Lendl's 94. Tursunov said on Thursday at Indian Wells that his leg was still bothering him but that he would "love to play" Federer. Roger Federer is optimistic after winning Dubai last week. INDIAN WELLS, Calif. -- Judging from all the talk on Thursday about back problems, you'd think Roger Federer, Rafael Nadal and Andy Murray were in their 70s instead of their early 30s or middle 20s. It's not really so surprising, considering the pounding players take day after day, week after week on the slow hardcourts that dominate the men's circuit. While awaiting their second-round matches in the BNP Paribas Open after receiving byes, Federer, Nadal and Murray held separate news conferences. Briefly, Federer's back is fine, Nadal's seems to be fine and Murray's is almost fine. Hobbled last year, Federer dropped from No. 2 to No. 6 in the world and failed to reach a Grand Slam final for the first time since 2002. However, the Swiss star coming off the title in his part-time home of Dubai, where he beat Novak Djokovic in the semifinals and Tomas Berdych in the final. "I'm just happy to see that the hard work is paying off," said Federer, 32, "and the decisions I took midway through last year were the right ones because I am playing nicely now and pain-free for a long period of time, which is the goal. Winning gives me confidence and makes me eager to play more and win more." With one title, Federer already has equaled his 2013 total. The four-time champion at Indian Wells (2004-06 and 2012) all but conceded that he will not add to his record of 302 weeks at No. 1. "If I can't play for world No. 1, I play for winning titles," said Federer, who's seeded seventh in the BNP Paribas Open and ranked eighth. "It's nice beating Novak, but what stands out to me is winning a tournament and holding a trophy in my hands. "It was a great bonus to beat Novak on a hardcourt ... and beating Berdych as well. So it's just nice I've been able to beat as many top-10 guys in two months than I did all of last year. Beating those two guys and winning the trophy, it was a perfect week. Similarly, Nadal bounced back from a stunning upset loss to Stanislas Wawrinka in the Australian Open final in January to win the inaugural tournament in Rio de Janeiro on clay last month. Nadal hurt his back early in the second set in Melbourne, took a medical timeout and fell 6-3, 6-2, 3-6, 6-3. "It was one of the toughest moments in my career," said the top-ranked Nadal, a three-time champion at Indian Wells (2007, 2009 and last year). "It was tough to be out there for one hour, 30 minutes knowing you will not win. That's not the important thing. Worse thing is you will not compete. "Was much harder than losing in six hours to Novak in (the 2012 Australian Open final). I had the match in the fifth. I (fought) for six hours -- should be more disappointing that one. For me, it was much more disappointing this one because I didn't compete. I did everything right to be there, to compete for the final, and I couldn't." Nadal, 27, described himself as "a great loser. I never think about the losses. Just a few hours, then I forget it, and I try to look straight to the next thing. Is true that after that, it takes a little more time, but here we are (in Indian Wells), and most important thing is be healthy on the back." When asked if his back was 100 percent, Nadal cracked: "Numbers are very difficult for me. I didn't make it very well in mathematics." Murray, who last July became the first British man to win Wimbledon in 77 years, underwent minor back surgery on Sept. 23 and returned at the beginning of this year. Although he has no titles in 2014, he reached the quarterfinals of the Australian Open, led Great Britain over the host United States in the first round of the Davis Cup and advanced to the semifinals in Acapulco last week. "The last couple of weeks I've really started to feel normal again, and I'm looking forward to hopefully playing some good tennis over the next month." Sacramento area, practices Wednesday in Indian Wells. INDIAN WELLS, Calif. -- Dmitry Tursunov emerged from qualifying at the BNP Paribas Open last year before losing in the first round to then-No. 119 Philipp Petzschner in the first round. Tursunov returns this year as the 27th seed. "I've just been relatively injury-free and able to tie a few matches together," the 31-year-old Russian, who trains at the Gorin Tennis Academy in the Sacramento suburb of Granite Bay, explained Thursday. "I didn't have any tournament wins, but I was able to get to the quarters and semis fairly often." The key word is "relatively." He skipped the 2013 Australian Open to heal nagging injuries, retired from his second-round match in the French Open with a pulled hamstring muscle, withdrew from Wimbledon lead-up tournaments because of the injury and retired from his third-round match in the U.S. Open with a thigh problem. For the injury-ravaged Tursunov, that represents improved health. In between his physical woes last year, he reached the semifinals in Marseilles, Valencia and Washington and advanced to his first Masters 1000 quarterfinal in Cincinnati as a qualifier and the quarters in Winston-Salem. Tursunov, who's scheduled to play former top-10 player Juan Monaco of Argentina in the second round at Indian Wells after receiving a bye, again has injury concerns. Troubled by a leg problem, he lost to Lukas Rosol of the Czech Republic in the second round at Dubai last week. Rosol, who upset Rafael Nadal in the second round on Centre Court at Wimbledon in 2012, then lost to Roger Federer in Dubai. The winner of the match between Tursunov and Monaco, a right-hander who was plagued by a right wrist injury last year, likely will meet Federer in the third round. "I'd love to play him," said Tursunov, who's 0-3 against Federer. "I wish I played him in Dubai, but I was a bit hurt and couldn't really play to the best of my ability." Tursunov has struggled in Indian Wells, reaching the third round (including a first-round bye) in 2009 for his best result in seven appearances. That's also the last year he won a main-draw match in the BNP Paribas Open. Tursunov missed the tournament from 2010 through 2012 with -- what else? -- injuries. "It's the desert, so the ball flies here quite well," Tursunov said. "I have less control, and that takes away a lot of my weapons. I rely on heavy hitting." Indeed, Tursunov has had trouble harnessing his power during his career. "I definitely do much better than in the past, but it's always hard to find the right balance," he said. "It's easy to look in retrospect what you should have done different, but it's a lot harder to have that idea as you're executing your game." Tursunov climbed to a career-high No. 20 and helped Russia win the Davis Cup in 2006 but underwent two operations on his left ankle in 2009 and one on his left foot in early 2010. Since plummeting to No. 516 in the world in July 2010, he has soared to No. 30. "I'd like to not focus on my ranking, but it's always in the back of your mind," Tursunov conceded. "It determines if you're seeded or you get into a tournament, so it's hard to get away from the rankings as much as I'd like. In simple terms, I'd like to be inside the top 20 this year, but I would have to improve certain aspects of my game." Those aspects are mostly mental. "I'd like to have a lot less focus on my results," said the candid Tursunov. "I'd like to focus a lot more on whether I'm doing the right things on the court, fighting every single game and staying even-keeled mentally. Sometimes I get tense and think too much about wanting to win and getting nervous about losing and being afraid to lose." Tursunov admitted he feels "the clock ticking" on his career. "There's really not much I can do about that," he observed, "so I might as well give up that fear and focus on how I can do well for the rest of the time that I do have available to me." INDIAN WELLS, Calif. -- Women's first-round matches in the BNP Paribas Open began Wednesday. But other than Shuai Peng's 4-6, 6-0, 7-5 victory over 2009 champion Vera Zvonareva, the highlights came in the interview room. Shortly after the loss by Zvonareva, the 2010 Wimbledon and U.S. Open champion coming back from shoulder surgery, the WTA tour held its all-access hour (actually two hours) as the top eight women's seeds met the media one by one. All 32 men's and 32 women's seeds receive byes in the opening round. As usual, all the top women except Serena Williams are here. The world No. 1 has boycotted the tournament since a 2001 incident in which her sister Venus defaulted just before their 2001 semifinal. Fans booed, and some allegedly made racist comments to the family. Li Na, China (1, 2) -- The two-time Grand Slam singles champion (2011 French Open and this year's Australian Open), who turned her acceptance speech in Melbourne into a comedy routine, on whether it's easy to find her name at the top of the draw: "It's always easy to find my name because it's the shortest ever. I have to say thanks to my mom." Agnieszka Radwanska, Poland (2, 3) -- The 2012 Wimbledon runner-up, on turning 25 today: "A lot of players are 16, 17, 18 years old. This is like sometimes eight years difference, which is a lot, right? So, of course, I don't feel young anymore." Victoria Azarenka, Belarus (3, 4) -- The two-time Grand Slam singles champion (2012 and 2013 Australian Open) and 2012 Indian Wells winner, on how she'd like to change sports: "I want to inspire kids to have fun playing tennis, not just to be pushed to play tennis, because I see that a lot. Being a (professional) tennis player, you go straight from 14 (years old) to 25. You miss that window because you've got to be responsible, you've got to be professional. Helping kids is (like going back to) childhood, and I love that. "I just had my first charity event (for Children's Hospital Los Angeles), and it has been my dream to be able to do that. This was just the beginning. I have so many ideas, so many projects to (work on), so I'm really excited." Maria Sharapova, Russia (4, 5) -- The four-time Grand Slam singles champion, and defending and two-time Indian Wells champion, on returning to her hometown of Sochi for the Winter Olympics and visiting the wall she hit against as a child: "I think I started playing because I was so bored watching my father play. I just took a racket -- it happened to be Yevgeny's racket because my father would play with Yevgeny Kafelnikov's rackets -- and I would just go on my own and hit against the wall. I kept doing it and doing it, and little by little I started playing with other kids, and it became more competitive." Angelique Kerber, Germany (5, 6) -- The two-time singles semifinalist in Grand Slams (2011 U.S. Open and 2012 Wimbledon) and Indian Wells (2012 and 2013) on the only time she has met countrywoman Steffi Graf, two years ago at Wimbledon: "I was so nervous that I have no idea what advice she gave me. It was nice to meet her because she is my idol." Simona Halep, Romania (6, 7) -- The WTA's Most Improved Player last year, on having more media obligations since cracking the top 10 for the first time in January: "It's a new style of my life now, and I have to enjoy (it). I don't know how to say ... I have to do this, so it's OK."
Jelena Jankovic, Serbia (7, 8) -- The former world No. 1 and 2010 Indian Wells champion on her new house in San Diego: "It's beautiful. I was just there, but it rained for three days. That was unusual. I practiced for two days on my own court, then the rain was just ... I said, 'Where are we, in England or San Diego?' "
Petra Kvitova, Czech Republic (8, 9) -- On the best advice she received after winning Wimbledon in 2011: "I remember when my agent told me that my life is going to be totally different ... but it wasn't really advice."